Hey there, I am wondering how long it took to set? It was bone dry by the next morning, it took a bit longer when I did it more recently in a bathroom. Depends how dry the room is I guess! can you use sheer curtains? I don’t see why not! Might have to work harder to get air bubbles out but principle is the same. Did I miss it or,,,,do you take the lace oder when it drys?? Oh wow, this looks so elegant. I’m going to try it when I get a chance. Altho my work colleagues may think I’m a bit weird (my office door has a window that doesn’t allow for any privacy and I’ve been thinking about what to do about it for ages) You’ve done such a neat job, it looks amazing! You did a fabulous job. unfortunately I have never tried it yet, but you inspired me. I got it off Pintrest & never tried it, but keep for future references. I really love it good for privacy thanks. Beautiful!! I have a bathroom window that I need to make a bit more private..
Let me know how you get on Bekah! I did something similar but bought acrylic glaze. It could be used in a bathroom and gently washed, but would require a razor blade and a LOT of scrubbing if you moved. This is gorgeous!! Love this idea so much! Thanks for sharing! I love this!!! Really pretty and it’s such a good alternative to plastic-y contact paper! So smart, and looks fantastic!! Glad you can now dress in the natural light without getting peeped on! Haha, thanks Staci! It was nice this morning. OMG I can’t get over this! We’ve done the whole typical frosted window film before but 1. it was rather a pain, and 2. it’s kinda boring. I love this idea! I don’t know that Derek would go for lace (boo!) but maybe I can twist his arm with a more “masculine” lace. Is that even a think? 😉 LOVE it! Ooh, what about some sort of polka dot lace? Nearly masculine? You can also use any semi sheer fabric, but then you have to get the air bubbles out (I bet you’d be good at that sort of thing; I’m not!). Wow, gorgeous Annabel!! I’m totally going to remember this for our apartment when we move. We did the frosted film in the bathroom of our current house and I’ve really loved the combination of privacy and sunshine. I love the idea of using fabric! That is so cool and it looks great! What an awesome idea! These are awesome!! I definitely want to try these in my bathroom – we get so much natural light, it’s just a shame to put up curtains! Oh so lovely!! Such a pretty option. Glad you like it Rachel, thanks for your comment! Gorgeous! It looks so good. I am in love with this idea! Thanks Katie! I’d love to see it if you try it out. Thanks Jennifer, so glad you liked it! It’s held up really well since I did it. I love this and am so glad you walked me through how you did it. Can I bother you for a photo of what it looks like from the outside? Hi Ann, so glad you like it! I can’t get a proper picture of the outside as we don’t have access to the back, but when it stops raining I’ll try and get one from army’s length with my camera. Hi, I’m interested in knowing a little more about the mixture. So it’s however much corn starch I want and match it with equal water and then boil the mix? Hi Brittany! You make a paste with equal parts cornstarch/cornflour and hot water and then add extra boiling water. In my case it was two tablespoons cornflour and two tablespoons water to start with and then I mixed in a cup and a half of boiled water from the kettle. I am curious how much privacy this actually allows. I have a bathroom window where it is ESSENTIAL that one cannot see IN…thoughts? Hi Heather! I’d say it totally depends on your fabric. If you’d be happy with getting changed behind the fabric as curtains then the fabric will be opaque enough for this window treatment too. I actually have lace curtains in this same fabric, and in both instances I feel happy getting changed behind them if it’s light outside, but I wouldn’t hang out without my clothes on with the light on if it was dark outside (It would probably be fine but I have no way of checking that in this window as we don’t have access at the back). So if privacy is really important, just pick a lace that is more opaque than sheer. (You’ll still be able to see through a little bit, but it will just be shapes, like a frosted window). Tonya Steele – what about mod podge? Would that work as well? We don’t really have modge podge here so I don’t know! It would be a bit more permanent I imagine. If it’s anything like PVA glue (I think it is) then I wouldn’t want to use it on wooden painted windows like we have, but it could work great on more modern windows. I wonder if colored lace would be more private? I love the clean look of the white lace, just wonder if a dyed lace would conceal more…. Guess I’ll have to check and see! Hi Viv! I think you might be right, but the main thing that would determine the opacity is how sheer/how many holes the lace has in it. I’m planning to update a picture of this post to show how visible my hand is through the lace, to help people decide if this is for them. I am trying it for sure! I am going to try it in my bathroom, I have paned windows too. I have an older house so no vent. But I am going for it anyway! Wish me luck! Oooh, good luck! Let me know if it works! I’d love to see pictures when you’re done Chris! So I have a question when the sun light hits it does it show the shapes of the flowers in the shadows??? I need to do something for my lil girls room and if it did she would love that. Ooh, I don’t know! It doesn’t here but the sun through this window isn’t direct (apart from about five minutes in the afternoon when I’m at work) and also the lace isn’t that high contrast. I think some laces definitely would (if the flowers were dark enough compared to the surrounding lace and the light was bright enough). If you try it, let us know!! If I used colored lace would the cornstarch show? I love this fr my apartment !!!! You need to take the lace down to wash the window. How cute! Loved it but what a shame to not use the scallops. Why not put just a few centimeters with the scallops at the bottom of the third row up. I may try this in my little girl’s bedroom, she’d love it. I’d love to see pictures if you do do it in your daughter’s room! I tried it and loved it. I blogged about it and credited you. Thank you sooooooooooo much!!! Hooray! That’s amazing, thanks for letting me know Michal! I love the results but live in North Dakota . Wonder how it would fare in the winter ! Hi Debra, I think it would work great in the winter! (Might even add a smidge of insulation!). Let me know how you get on! Ooh, thanks for the tip about removal (going to have to try that soon). I’m across the pond….I love the idea and hope to give it a try! Hooray! I’d love to see pictures if you do! Love this! Thanks! You can also use liquid starch from the grocery store. It also works on fabric to cover walls too. Same thing releases with water. Great ideas!! This is an amazing idea! We moved into a new apartment a couple months ago and none of our bedrooms had any sort of blinds in them. We put up curtains but we block out so much natural light just for the sake of privacy that they hardly seem worth it. I think I’ll just surprise my husband one day and do this in our bedroom! Thank you for the wonderful idea! So great. I guess you won’t be able to clean the windows anymore though?? You can’t really clean the windows, but it does dry hard enough to dust! If they get really dingy you can take the lace down, wash it and reapply. I’m going to do this on a small china cabinet that I’m using as clothes storage. I’m excited! Oooh! That will be so pretty! Do you leave the lace on the window? I love this idea. I have laid the lace on furniture and spray painted it and removed the lace. Yes, for this application you leave the lace on. This is fantastic! We’ve recently started renting a unit and the bedroom window faces directly into the driveway so anyone walking past can see right in. I’ll definitely be using this to make it a bit more private! I love this i need for my apt. My bedroom windows . I know what im doing tomorrow. This is so gorgeous, thank you for sharing!! I live where it gets very cold for 6 months out of the year. Will this work on windows that frost over and produce condensation quite often? I should think so! It would be good to apply it while it’s warm so it gets a chance to harden nicely before the first condensation hits. It would be worth a try for sure! So great to have stumbled across this as I have a window desperate for treatment. Wondering how well this would work on larger areas of glass. Just have to try it I guess! This would be great on clear glass china cabinet doors as well, especially if you store anything in the china cabinet other than beautiful china. Love this idea..thanks for sharing. I wanted to just ask if the second time you apply the goop..do you apply with the lace on the window already for apply it to the lace once you have the pattern cut out? Such a cute idea…I have a window that is tall and narrow, have blinds there now but would much rather have this. So pretty!! I think either would work, I applied it to the lace on the window. Good luck! Could you use mod podge? I have plenty of that. Does the lace itself make it look frosted? We don’t have modge podge over here so I don’t know! 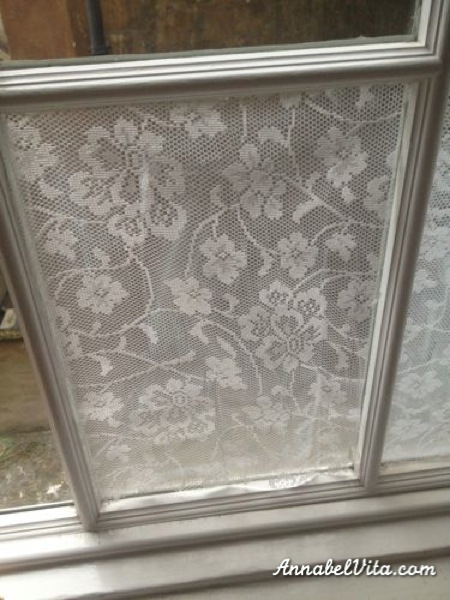 The lace makes the window look frosted (so for privacy you wouldn’t want anything with too large holes). What a wonderful idea it’s look so easy,so prectical.your work is so neat.thanks a lot to share such a practical thing. So stunning. Do you think it would be as beautiful if I used colored lace? Or would it end up looking tacky? I think it depends on the lace! There’s no harm in trying though! Hi there. The cornstarch you are using, is it the same as cooking cornstarch ? Yes! It’s called cornflour in the UK but I think it’s something different in the US. Really really like this idea so I tried it last week on a large window that looks directly out on to a pavement. Unfortunately the lace has all peeled away from the window panes. Any recommendations as to what I was doing wrong? I followed your instructions exactly. Hmm I don’t know, did you use enough cornflour? Maybe it takes too long to dry on large panes. I’m so sorry it didn’t work for you. I have used similar treatment using fabric to wallpaper a wall. Only i used liquid starch. Also washes off with water, but far more expensive. I will use this idea. Thankyou. I did a ” stained glass” look to my bathroom window with acrylic paint and sealed it with clear spray paint. The window got wet every time someone showered. When I had to move 3 years later the acrylic paint underneath was still protected and unblemished. I used a razor blade to start the removal and it came off in strips. It is my guess that clear spray paint would seal this as well. Reblogged this on Heavenly Herbals. I’ve done similar in a bathroom, only with a permanent solution. I used a plastic lace tablecloth with a glass etching solution, it works great! This way it’s waterproof and cleanable! If you mix the cornflour with the same amount of water (eg one tablespoon for every tablespoon) you should get a very thick paste, which you get then water down. Hello! Planning to sort the pictures ASAP, but got a five week old baby so may be a few days! Iam in love with the idea iwant to get up and do it now thank u love to create things for my place. Fantastic idea 😉 I’m wondering if there could be a way to make it a permanent window treatment. I’ve used the plastic version on our front door windows (it’s not too bad but painful when it gets older) could a clear varnish do the job? I don’t know, but would be worth a try. It’s really an answer for my problem, great instructions….thanks for sharing…. 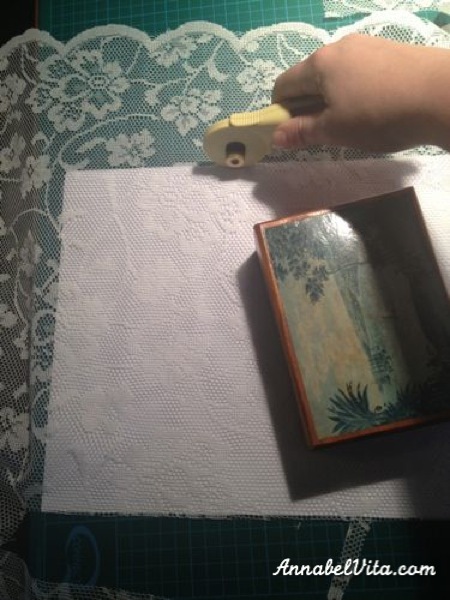 Why not just glue the lace to clear or frosted contact paper? That would work too! I found this easier, I hate using contact paper! I really appreciate this application – when we were first married and living in a one room apartment with a concrete floor (45 years ago!) I bought blue shag rug scraps and put them together with duct tape and I stuck striped cloth to the walls with spray on starch! Both looked wonderful. When it was time to leave — both things came right up and the landlord was both surprised and pleased! The cornstarch itself dries clear (eventually!). I think it would work with heavier lace! Aww! This is so pretty!!! As someone who rents, I think it’s fabulous!! what an amazingly cool window treatment. I love it. Great job. 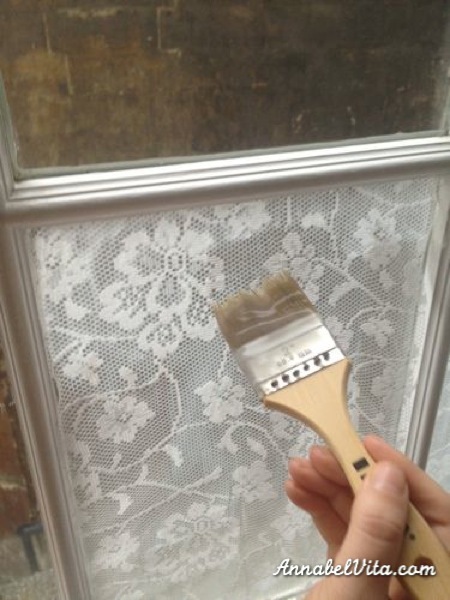 Thanks for sharing this awesome idea, I’ve been looking for an easy way to help my friend cover some side windows and this will work perfectly, I think that another way to help the lace stick to the windows good would be to use decoupage it too can be easily removed with soapy water, it just doesn’t peel off in humidity, it’s worth a try in the bathrooms. Hi Does it turn yellowish with time? How do you clean the vanes? 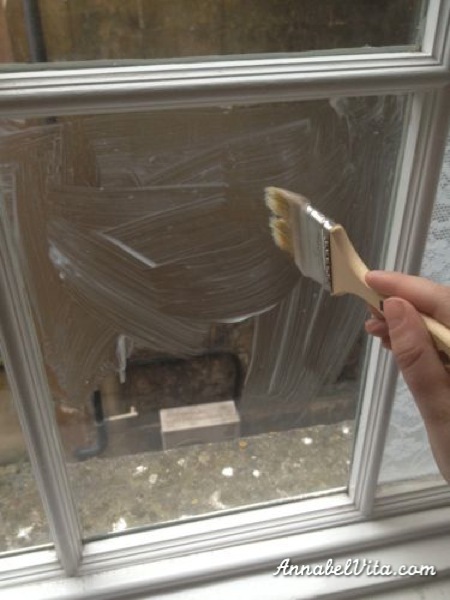 Mine didn’t go yellowish and we didn’t clean the panes – you could easily remove it to do so and then put it back up. Love this idea. I may try it on a half circle window above some casement windows – more to diffuse the morning sun than privacy. Would have used it on our bedroom windows that face our neighbor, but the hubby finally bought me a curtain rod for the room, so going to make curtains from ribbons – he wants air in and I want privacy LOL. Thank you sooo much! Did that today, looks awesome! I want to do this in my bathroom! But since our bathroom does not have a fan, do you think the steam or hotness from the shower will ruin it any way?! I would love to do this because I have a little window that has this ugly awkwardly hung curtain covering it. I want natural light shining through it. What do you think!? I think it’s worth a try (it’s really so easy!) and you could always replace once a year if it needed it. Let me know how you get on! so lovely, good reading other peoples comments as we too were interested in doing it in bathroom. Great stuff! 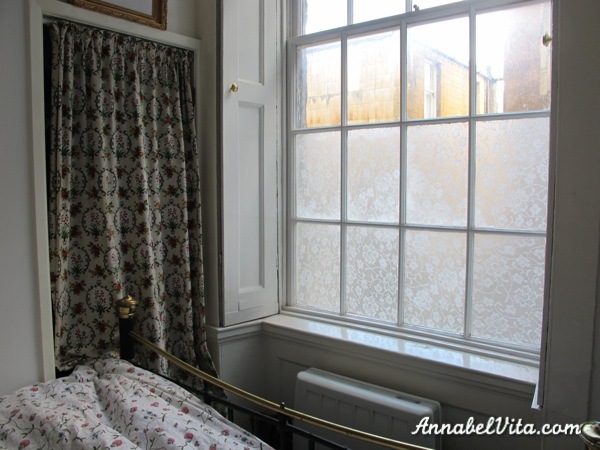 Pingback: DIY Lace Window Treatment With Cornflour - DIY - All in One! A good solution from the view of curious insect screen but can sometimes help. I was going to do this with tissue paper, but this looks better. My house was built in 1908 and lace will be in tune with the styles of that time. I’m thinking I should look for some lacy sheer curtains for the windows and get an extra panel to cut up. could you use this on skylights. I don’t see why not – let me know how you get on! Love the idea! Thanks for sharing! Ik would love to publish it on a page of a magazine. I am an freelance editor for an Evangelical Broadcasting Radio and TV magazine in The Netherlands. (called EO Visie) I made each week a nice page full of ideas DIY and other stuff. There is also space for a small tutorial. For the edition themed ‘White’ I would like to publish 3 of your photo’s. Hi Gerdien, that’s fine, as long as the credit underneath the photos is the same size as the description. Please email me a pdf of the page to annabelvita@yahoo.co.uk. Annabel, thanks for sharing your talents. I love lace & the elegance it portrays. I want to try this on some windows. Great idea! Solves my problem perfectly of how to cover my door window. Have you seen it done using other fabrics other than lace as well? I also like the tension rod curtain at the top of the window. I would also like to do that. It’s have to see it clearly in the photo. 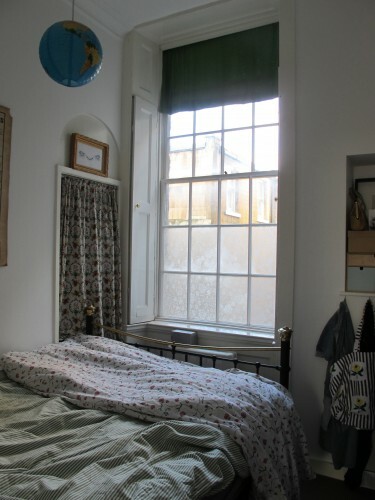 Can you provide details — is it a roman blind, did you make it, what is the fabric? I’m so glad you like it! It’s a totally fake Roman blind, I just folded a piece of fabric in half, sewed it together at the top and turned it inside out, then put it on a tension rod. I hope that helps! Let me know if not and I can draw a diagram. You could also try reading Manhattan Nest’s tutorial – I think I linked to it above. I’ve also seen people try with laundry starch spray. Uhm – this is genius, and I am going to the fabric store immediately. For humid areas you could try the Gallery glass, faux stain glass paint products. They made a clear that I used to approximate seed glass, and also applied more thinly to approximate frosted glass. Just wondering if you could do this on “double-pane” windows. A lot of manufacturers recommend that you don’t apply anything the window because of the “air, aka gas” that is between the two panes of glass that help with temperature control & condensation reduction. I have found a film that you can put on your windows that makes it possible to see “out of” but almost impossible to “see into” depending on the darkness of the tint. It actually states right on the package, DO NOT USE ON DOUBLE-PANE WINDOWS. I think it has something to do with increasing the temperature of the gas inside an thus increasing the likelihood of causing the seal to break and then the window would “fog up”. So I ended up using it on my storm door/screen door (the glass portion). I have a large front picture window and would like to do something like this but would hate to have the seal break and have to spend thousands replacing a window. I’m afraid I have no idea! Maybe ask the manufacturer. Scotch guarding spray may work to set it & keep it from getting dirty..worth a try! I did this this morning but later when I checked on it I could see the cornstarch through the lace I took it off and cleaned everything up and washed the lace. Did i use too much of the mixture or did I not thin it down enough? I want to try again as soon as the lace drys. Hmm, is it cold where you are? I think it took 24 hours to go clear when I did it! Its great I also done this to my window and it looks awesome. I’m wondering if you could add dye to the starch solution. I did it in bathroom next to the shower but not right in it, it was fine. 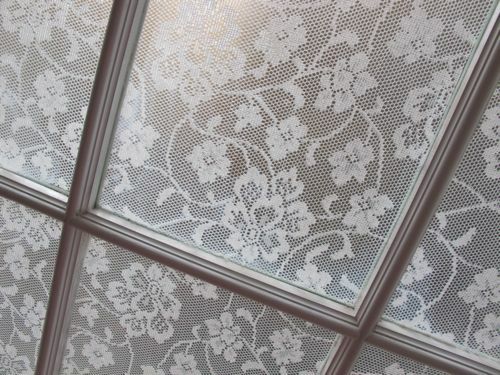 I used cut down ikea lace curtains but I’m sure both would work! I tried this and it looked lovely for couple of months, then then lace started falling off. I’m going to try to reglue it with spray adjesive. how would someone go about removing this? Is it okay for rentals or am I better off not risking it? Click the link at bottom of post to see how I removed it. This was in a rental.